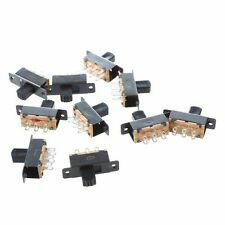 500pcs MINI SLIDE SWITCH - SPDT. SPDT (2 POSITION) ON - ON. = = = This Sale for 500 PC LOT = = =. ROUND GOLD PINS - DIA: . 039" / 1mm. LARGE QTY AVAILABLE. NEW SWITCHES AT BARGAIN PRICING! 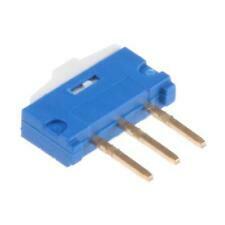 Knitter Switch Micro Miniature Slide Switches - MMP / MMS Series. PCB Slide Switch Latching 500 A @ 12 V dc. Power Switching IC. Substitution Boxes. Motor Drivers. Motor & Servos. Slide Switches - Signal. 10 x Miniature On/On Slide Switch DPDT. This covers things like an LED resitor calculator, all about diodes and capacitors plus much more. RoHS compliant. FAQ's, Tutorials & Projects. All our circuits are made by humans rather than assembly lines so that we can help growth by employing staff within the UK. Rated at 6A 125VAC or 3A 250VAC. 100 Mohm isolation resistance. Mounting holes are 1.122" center-to-center. Circuit SPDT. A right angle slide switch designed for PCB mounting. You will receive 5 switches. 6 connecting pins for PC board mounting. 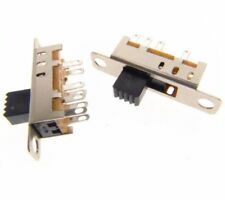 You are purchasing part number OS102011MA1QN1 Manufactured by C & K COMPONENTS. SWITCH SPDT 0.1A 12V PCB R/A. of Electrical Operations : 10000. Orientation : Right Angle. Switch Operation : On-On. 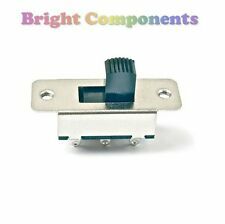 Switch Mounting : Through Hole. Load TypeFluorescent /LED 0-10V. Length 2.00 in. Width 2.00 in. Height 4.10 in. Wireless OperationNo. Operation TypeSlide Paddle Preset. 5 Pieces - Slide switch. New by NKK Switches. SPDT Ultraminiature slide switch. 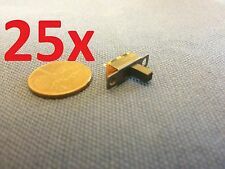 4 x 6.5 x 10.2mm shunt. ALCO MHS.233. 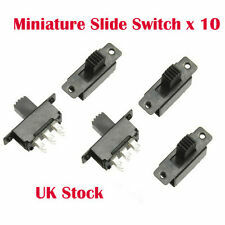 RA 3-Position Slide Switch Quantity-10. We will hold orders until you are finished buying. 2 Pieces - Slide switch. C&K 1201 DPDT Miniature Slide Switch - 20 V AC / DC - PC Board Mount. Series: 1201. Miniature slide switch. 6 connecting gold plated pins for PC board mounting. A vertical mounting SPDT slide switch with PCB pins on a 2.54mm pitch. Ultra-miniature slide switch. DPDT PCB mount slide switch lot of 10 pieces. The part number is SS2210RG12. The Alltronics part number is 98B012. (¡À2%) x Slide Switch. Switch Total Size : 8 x 4 x 10mm/ 0.31" x 0.16" x 0.39"(L W H). Toggle Switch 3 Pin. 15 Pieces - Slide switch on-off. Miniature Slide Switch. Pitch: 2mm. Switches are commonly replaced parts in power tools. A switch handles all on/off and variable speed functions. If there are any restrictions to your country it will advise you of that during checkout. ONE NEW DPDT ON/ON Microphone PTT slide switch. Type: PTT Slide Switch. Face Plate: none. Handle: 0.6" (L). Mounted height: . 293" / 7.46 mm. 10 Pieces - Slide switch. Right angle miniature slide switches. 6 connecting pins for PC board mounting.